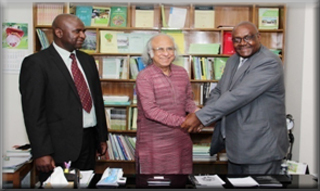 A two-member-official group from the Zimbabwe Association of Microfinance Institutions (ZAMFI), an apex body for microfinance institutions in Zimbabwe, paid a study visit in PKSF during 18-22 October, 2015. They met the high officials of PKSF and held discussion on the management and operational strategy of PKSF, performance indicators of PKSF’s programmes and other programme management issues. The team went to field visits at PKSF partner organizations named Sajida Foundation in Dhaka, YPSA and IDF in Chittagong. 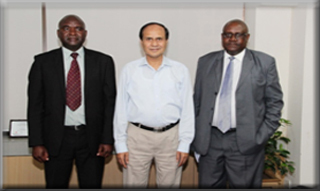 Mr. Godfrey C. Chitambo, Executive Director, ZAMFI and Mr. Brian Zimunhu, CEO, Zimbabwe Microfinance Fund (ZMF) meet the Chairman and the Managing Director of PKSF and hold fruitful discussions.